Property 31: Tweety Home is a precious relaxing corner in the heart of the Crete Senesi. Chiara &amp; her husband Gianluca were the kindest and most welcoming hosts we could have asked for. Their property was cozy had all the amenities and beautiful views! Would absolutely suggest staying here in the Tuscan region! The compound of approximately a dozen separate casas is well maintained. It is located on a high point approximately 2 km north of San Giovanni d'Asso on the road to Montisi. At least six hilltop towns are visible from the location all within an hour's drive. The property is surrounded by beautiful rolling Tuscan hills. My wife and I like space so we rented a casa with two bedrooms and a bath upstairs and a living area and kitchen/dining area and bath downstairs. We had a private patio and yard. The accommodations met our expectations....very comfortable but not extraordinary. The property has a swimming pool for guests that looked very inviting, but it was too cool for anyone to enjoy this time of the year. Grocery stores and ristorantes with good food and value are close by. 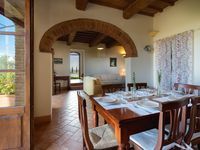 I would recommend this property to my closest friends if they wanted to enjoy and see this part of Tuscany at any time of the year.